Last weekend we visited a couple of wineries in Placerville (California) and we got the chance to taste some great wines from that area. 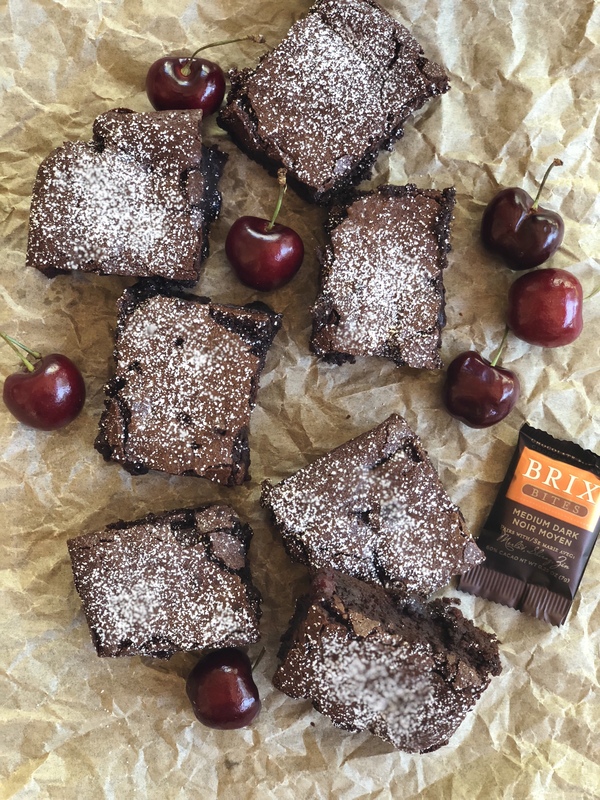 Today, I was in the mood for brownies, so I thought why not using some of the port wine we got to infuse some cherries to add it to my brownie batter. The result of this experiment was amazing so here I am to share the recipe with you! 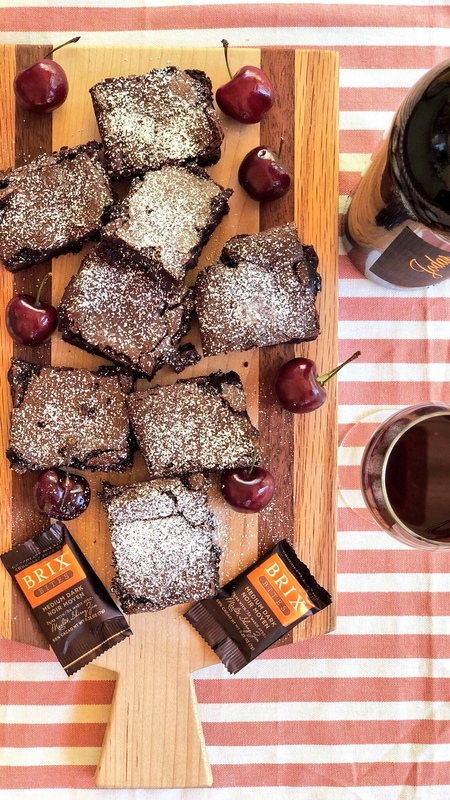 For this recipe I used my favorite chocolate for wine: Brix Chocolate, if you haven’t tried them yet, I recommend that next time you have a “wine tasting day/night” with your friends, you get some Brix chocolates and indulge yourself. 1.- Preheat oven to 350 F. Line an 8×8 baking dish with parchment paper. 2.- In a small bowl mix the chopped cherries with the port wine. Set aside. 3.- In a medium bowl, sift cocoa powder, flour and salt. Set aside. 4.- In a small saucepan over low heat, melt butter. Once the butter is melted, add the chopped chocolate, stir constantly until the chocolate is melted completely. Let the mixture cool for 5 minutes. 5.- In a bowl of a stand mixer with a paddle attachment on medium speed, beat brown sugar, white sugar and melted chocolate. Add in eggs, one at a time, beat for one minute or until the color of the batter lightens just a bit. 6.-Turn the speed to low and add in the flour mixture, beat for 1 minute. Then add vanilla extract and the infused port wine cherries (liquid included). Beat for about 2 minutes or until all is well mixed. 7- Pour batter into prepared pan and bake for about 50 minutes, or until a knife inserted comes out mostly clean. 8- Let it cook for an hour and then cut into squares. You can sprinkle some powdered sugar on the top. 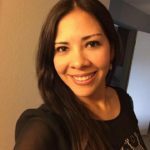 This entry was posted in Recipes and tagged brownies, cacao, chocolate, dessert, port wine, recipe, wine.